Jesse, fifth from top right, with his Chapter back in 2015. As an astronautical engineer, Jesse Greaves (RPI, ‘18) will be focused on the space above, but the last few years have given him the opportunity to appreciate the ground below. Realizing he might not have a break for quite a long time, the recent graduate of Renssalaer Polytechnic Institute (RPI) in Troy, New York, embarked on a journey that would take him across the United States and Europe prior to classes starting at the University of Colorado, Boulder, where he is working on a Ph.D. Eventually he wants to work for a large space company and then become a professor. In December, after completing a co-op at the MIT Laboratory in Lexington, Massachusetts, he flew out to Los Angeles to visit a friend who was working at a NASA jet propulsion lab, and they started a road trip across the United States. The two of them would later go on to backpack across Europe following graduation. As a collegiate brother, Greaves said he joined the fraternity in his sophomore year after leaving the lacrosse team. He says the team did not provide the exploration and variety he was looking for in college in order to expand his horizons. The fraternity provided those opportunities. At Phi Kappa Theta, he became the Chapter’s scholarship chair and then served as Vice President of Operations, maintaining the house by waxing floors, painting and making sure the property was kept in good shape. “It was a stressful year of my life, but the house gave so much to me; I had to give back to the house.” Through a brother, he was able to apply for the internship at the Lincoln Lab. As someone who skied before he walked, Greaves, 23, enjoys hiking, ice climbing, white water rafting, rock climbing and photography, so travel was a natural thing for him. Cliff diving in Naples on the Amalfi Coast. What better way to end a trip? Main Image: Brother Jesse Greaves (RPI, ‘18) enjoying the view of Prague in the Czech Republic. U.S. Air Force pilot David T. Dinan III (Massachusetts Institute of Technology, ‘65). It was on St. Patrick’s Day of 1969 that David Thomas Dinan, III (Massachusetts Institute of Technology, ‘65) lost his life serving our country in the Vietnam war. A native of Nutley, New Jersey, David was born in January of 1944. He was educated and graduated from Seton Hall Prep in 1961. According to his brother Charles, who currently resides in McMurray, Pennsylvania, “he was both athletic and intelligent.” David excelled in science, and, following his graduation from Seton Hall Prep, he applied and was accepted at Massachusetts Institute of Technology. While at M.I.T., he majored in Physics. As a young student at M.I.T., David attended a rush event at the Phi Kappa Theta chapter on his campus which was chartered in 1919. According to one of his brothers, Frank Russo ‘64, “Dave was a quiet, thoughtful, solid, sober, devout young Catholic man, perhaps more so than the rest of us.” An outstanding student, and a loyal brother, David graduated from M.I.T. and enlisted in the Air Force in 1966. Just as he had excelled in school, athletics and the fraternity, David quickly rose within the ranks of the Air Force. He became a First Lieutenant and was awarded two medals. Those medals were the Distinguished Flying Cross and a Purple Heart for injuries he suffered serving our country. He was a member of the 34th Tactical Fighting Squadron. On that very fateful day, March 17, 1969, David and another pilot were on a mission flying over northern Laos. His F-105 had been hit by an enemy attack, and he radioed in a distress message. To avoid a crash, he ejected himself from the plane with his parachute which landed in trees in a remote area. Unfortunately, the parachute tore on tree limbs and David tragically dropped to his death on the jungle floor. His plane subsequently crashed and burned. A search and rescue team arrived, found the wreckage, the parachute and David’s remains, but had to evacuate given enemy fire. Unfortunately, neither David’s body, or any of the debris from the wreckage were ever recovered. As a man of 25, who was engaged to be married, this was an extremely tragic way to die. According to his brother Charles, “We anticipated his remains to be returned a week or two after he went down,” but that never happened. Retired Col. Ed Sykes, one of David’s roommates at the Korat Royal Air Force Base in Thailand, and David’s biological brothers began lobbying for his remains to be located and returned for proper burial. Through their efforts and those of Leland Sorenson, who was a member of the original search and rescue mission who had identified the remains back in 1969, the group returned to Laos in March of 2014, 45 years after David’s plane crashed and burned. On the third day of their mission near Ban Khap in the Xiangkoang Province, they discovered David’s plastic identification card. In June of 2016, an excavating crew was sent to the area where they collected his remains which were positively identified on August 7, 2017. David’s remains were flown from Laos to Hawaii, and then to Washington, D.C., where he was interred in Arlington National Cemetery on April 25th of this year. David was one of 600 Americans who disappeared or were lost during the Vietnam War in Laos. A total of 1,597 Americans are still unaccounted for from that war. According to Frank Russo ’64, “When I heard that David had been killed over there, my initial reaction was of great sadness, that such a good and gentle soul, with so many gifts, should have been lost in such a place.” David now rests in peace at Arlington National Cemetery with many other Phi Kaps including our late President, John F. Kennedy. Main Image: Above: The remains of U.S. Air Force pilot David T. Dinan III (Massachusetts Institute of Technology, ‘65), of Nutley, killed in the Vietnam War, proceed through Arlington National Cemetery on April 25, 2018. Brother Taylor Dreher (RPI, ‘17) (right) with Brother Christian Reed (SDSU, ‘17) (left). Two men find themselves in the dental office during their time at Officer Candidate School in Newport, Rhode Island. They begin discussing college and fraternity life and realize that they are both brothers of Phi Kappa Theta. Christian Reed (San Diego State University, ‘17), and Taylor Dreher (RPI, ‘17), were both candidates for Naval Officers at the time, and, now, they are currently roommates in Pensacola, Florida, in their first phases of flight training. Brother Reed said, “Having a fellow brother in the same program […] has made my adjustment from civilian to military life much easier,” although he has wanted to serve in the military since his eighth grade field trip to Washington D.C. He remembers his intense appreciation for our men and women in military uniform as he toured the Pentagon and as he paid his respects at the Tomb of the Unknown Soldier. 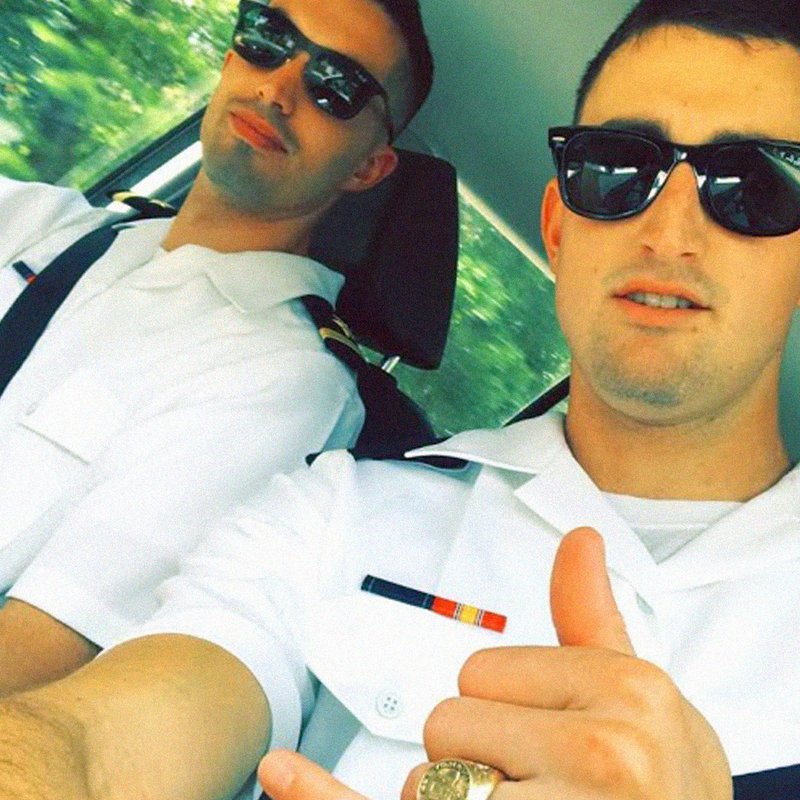 It was happenstance that two brothers of Phi Kappa Theta from completely different sides of the country ended up in Navy Officer Candidate School in Newport, Rhode Island, during February 2018. It was coincidence they met at the dental office. But it wasn’t by chance that their ties of brotherhood stood the test of OCS and helped them both graduate as Officers and will help them grow in their Navy careers. Main Image: Brother Taylor Dreher (RPI, ‘17) in his naval uniform on the left and Brother Christian Reed (SDSU, ‘17) in his naval uniform on the right with other brothers from SDSU. As of late, a few of our Phi Kappa Theta Fraternity chapter executive boards have been asking about best practices when finding an advisor. In any situation, being without a mentor can make an individual or group seem a little lost. The imagery of a ship without a captain comes to mind: what would a bunch of pirates do out to sea with no chief swashbuckler to set the course? While our organization technically does utilize and endorse an advising model (sans swashbuckling...), we prefer to use the term "coaches" when referring to the individuals in these roles. We do this in order to encourage a more dynamic relationship that emphasizes the idea of creating a two-way street communication style. The more that both parties understand that success can come as a result of collaborating and listening, the more likely both parties will find success - and enjoy the journey along the way. Last month Phi Kappa Theta hosted its second annual Servant Leadership Summit, during which ten new Performance Coaches began their training. These individuals – a combination of alumni and community volunteers – will act as an extension of the Executive Offices. Each has the ability to offer tailored support, guidance, and challenges to three collegiate chapters. By adding this personal level of support to chapter leadership and operations, Phi Kappa Theta hopes to be able to challenge our members to be better leaders while supporting them through difficult conversations and decisions. Performance Coaches are gearing up to hit the ground running with their chapters in January of 2019. These two things, difficult conversation and decision making, were large parts of the Servant Leadership Summit. We wanted to treat this Summit as the foundational beginnings to a new initiative; we hoped to get all of our coaches in the same room, have intentional conversations about the Fraternity and Chapter Operations, and have each individual leave with the same action item: guide but not decide. This notion comes from Sanford’s Challenge and Support Theory. The long and short of it is the idea that challenging an individual too much may see them buckle under pressure, whereas overwhelming support results in minimal learning opportunities. Performance Coaches had several opportunities during the Servant Leadership Summit to discuss what that means and how to navigate tough coaching conversations. Pirate analogies aside, here are some of the principles that we discussed with coaches. Our hope is that it can translate into your own situation, whatever shape or form that may take. Phi Kappa Theta wants to extend a challenge to you: can you identify a mentor or coach within your office, profession or community at large using these criteria? Coaches in your community should first and foremost be accessible. They should want to speak with and listen to members within your chapter. They should be good listeners. In fact, some of the best mentors speak less and listen more. Find someone that will listen to a chapter's questions, goals, insecurities, ideas, etc. so that they can get a good idea of the executive board's strengths, weaknesses and desires. Coaches used as sounding boards can be a great way for student leaders to “make mistakes” without making mistakes that have long-term consequences on the chapter. Coaches should be the type of people who like to encourage others, especially coaches that identify with the mission/vision of Phi Kappa Theta. They also should be the type of individual who can gently but firmly tell someone an idea is bad without destroying creativity. Coaches should have experience and wisdom (the two don’t necessarily always go together). That is, they should have learned from their own mistakes. Think of some alumni in your area who may have had leadership experience in your own chapter. Coaches also should be willing to be “coached" by their chapter. Any manager, mentor or advisor should be willing to learn from others no matter how young, seasoned, educated — or not — someone is. Coaching is a two-way street: they coach members, and members coach them on how they want to be coached. Interested in becoming a Performance Coach? Contact us.